← Is Archery a Good Skill for Good for Preppers? The other day I received a phone call from someone claiming to be from the IRS, warning me that the IRS was about to file a lawsuit against me for back taxes, and of course, they wanted money. Two things immediately clicked in my head. First, I knew that the IRS would not contact anyone in this manner. They always contact by mail or they show up at your door. Second, I knew that my taxes were paid. So I laughed at the caller, hung up, and reported their phone number to the authorities. 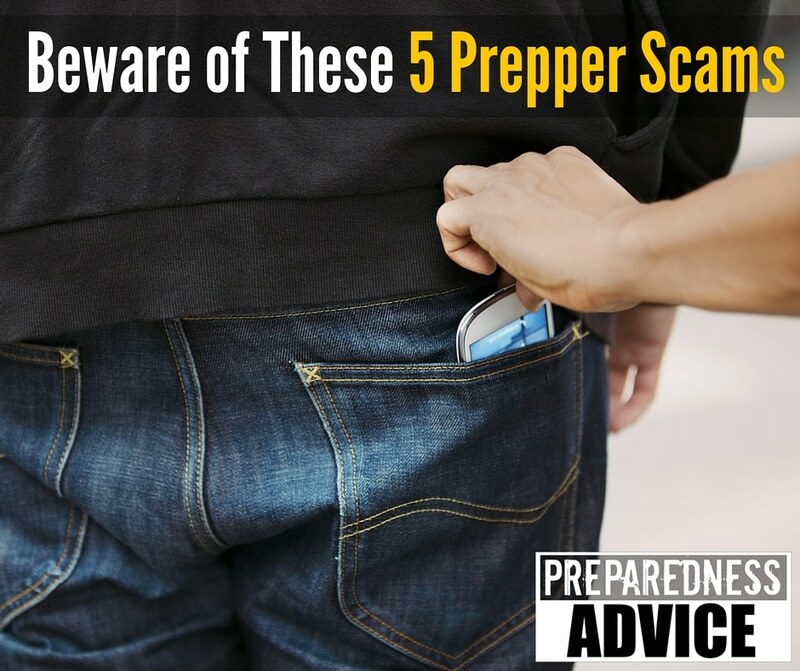 This got me to thinking about various scams that I see being spread around the internet aimed at preppers. Now if you are like most of us, you don’t have a lot of money to waste, plus you have worked hard for what you have. Because you are a prepper, you want to stockpile the necessary food and other supplies that you need. This can get expensive very quickly and you only have a limited budget, so you can’t afford to waste money on scams. New products and services for preppers are appearing on the market almost every day. Many of these products are produced by snake oil salesmen and are designed primarily to separate you from your money. I hate scammers, in the first place, but even hate more those who spread fear and then try to make a buck off of it. Here are some examples. Food – Beware of new food companies that don’t have a good long track record. Many of the new products appearing on the market are not properly packaged. They contain too high a percentage of oxygen. One very large and prominent company, although new on the scene, was greatly embarrassed a few years back when an independent lab discovered extremely high amounts of oxygen in their so-called “survival food”. I have seen food packages that claim to be a 3-month, 6-month, or even a year’s supply that looks good at first glance until you take a look at how many calories they are providing and you find out that there is only 600 calories a day. This food package is merely slow starvation for the very people who trusted the company to sell them something that would help guarantee their survival. When you compare food products, be sure and check the size of the servings. Many companies sell packages that make it sound like you get a large amount of servings, but when you look at the small print, you find that they are only ¼ cup servings. Count calories, not servings. You need at least 2000 calories a day. Water filters – Again, stay with well-established companies. There are new filters coming on the market all the time. If you are interested in them, make sure that you check to see exactly what their filter will do. Personally, I recommend that you stay with companies that have been around for at least 10 years or so and the Berkey and Sawyer brands are 2 examples. Books, tapes and other information packages — I constantly see people who claim to be ex-special something or other or a former CIA agent selling expensive secret information packages that are supposed to teach you how to survive everything. Don’t fall for one of these. There are good books for sale at reasonable prices and tons of free information on the internet. Medicines – I personally feel that there is a lot of validity in herbal medicine, and I use it myself, but don’t take everything you read on the internet as the truth. Study and find out for yourself. Find real experts, and not someone who suddenly appeared on the internet with wild claims. Herbalist Sam Coffman is one well-regarded expert who takes his herbalist practice on the road into Central America to provide (alternative) medical care for the people there. He teaches classes in the San Antonio area. Cat Ellis is another herbalist whose website and book, Prepper’s Natural Medicine, have a prepper emphasis. Here is an excellent summary of what to look for when it comes to herbal information and instruction. Solar power – Learn about it before you buy. There are a number of products that I would not trust that are currently on the market. Check and see where they are manufactured. Start small when it comes to solar. First get a solar battery charger and then a solar oven, whether you buy one, like the Solavore, or make one yourself. Inexpensive solar panels can come next, but beware of expensive, whole-house sytems tied to the grid. Based on studies I’ve read, the return on your investment of something like that takes many years. There are always going to be new and better ideas coming out and some of them really are better, but a percentage will always be scams. Take your time and learn about products before you buy. Generally, if a company/website has to resort to scare tactics via emails or a fear-mongering video, steer clear. Don’t waste your hard-earned money on scams. Remember if it sounds too good to be true, it probably is. This entry was posted in Self sufficiency, survival, Threats and tagged Berkey, calories, food storage, herbalism, scams, solar, water. Bookmark the permalink. Thank you for this. Gives a lot to think about that I hadn’t. Thank you for this article. It is very true because I get a lot of e-mail from prepper sights that offer very expensive items that I myself could never afford. As much as we try to prepare for the worst money is tight and I myself cannot afford all the gizmos and gadgets that preppers have and offer for sale. Some preppers will be holed up in thier nice bunkers eating organic foods while I will be lucky to survive in a basic lean to if I have to. The link to the solar battery charger seems to have some issues. One review in particular said it would take a couple weeks to charge in full sun. And it’s probably going to get worse as the world spirals . . . It’s after the hurricanes (here in Florida) that the scammers/creeps show up. Thanks. Amen. I’ve caked the good companies about their low calorie foods. We’ve gone found and round. They have told me, is intended to be supplemented. I’ve responded with 1) then it’s not a years supply, and 2) where does it say that in the advertisement or on the package. They hang up, or one company told be we’d just have to agree to disagree.